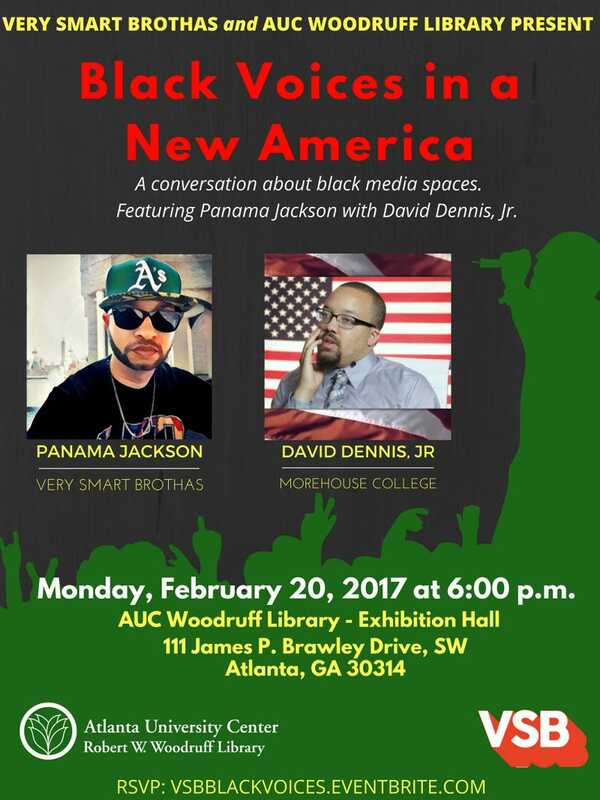 Black Voices In A New America: A Convo About Black Media Spaces featuring Panama Jackson and David Dennis, Jr.
For the ATLiens in the room, (and brought to you by VSB and the Atlanta University Center's Robert W. Woodruff Library), join Panama Jackson and Morehouse College Professor and Writer, David Dennis, Jr. aka Davey D. for a talk about Black voices in a new America. This new reality has created many questions for those of us who operate in media spaces: How do we best utilize our voices and platforms to effect change? Do we feel a responsibility to speak more about politics and society? How do you maintain the balance of staying true to your mission while also engaging with the new political world? What is our obligation and responsibility as platforms? How do you stay accountable in a world of “fake news” and salaciousness headlines? These questions and more will be discussed in a candid conversation about the role of Black media platforms, especially, in this new version of America we now occupy. In a post-Obama world, sites like VSB have grappled with what it means to exist as a voice and how to ensure that in a country divided along racial and ideological lines, we continue to maintain our vision and identity as a purveyor of Blackness in an irreverent and unapologetic manner. On a personal note, it's going to be dope to speak where it effectively all started. I've spoken at other HBCU's but it will good to be back in the AUC, and I'll actually be speaking on Morehouse's campus earlier in the day to students in the journalism program at the 'House. Also, be on the lookout for a VSB Meetup in Atlanta on Sunday, February 19th! I'd love to meet and have a drink with friends!